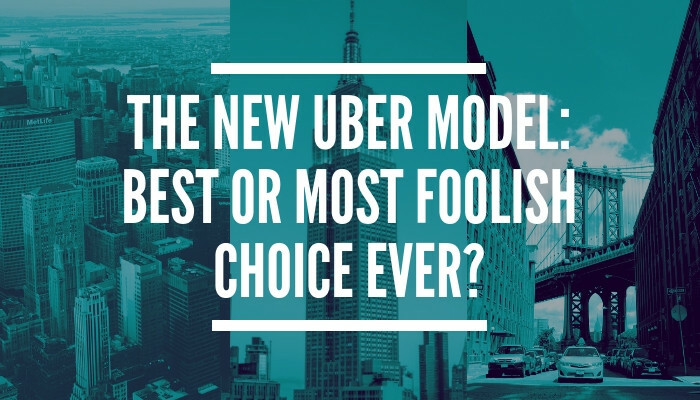 Last week, the ‘new’ Uber CEO published their new model in which the company will start focussing on transportation methods other than cars only. “During rush hour, it is very inefficient for a one-tonne hulk of metal to take one person 10 blocks,” he told the Financial Times in an interview. “We’re able to shape behaviour in a way that’s a win for the user. It’s a win for the city. Short-term financially, maybe it’s not a win for us, but strategically long term we think that is exactly where we want to head.” An important step and confession is made regarding Uber’s future as an “urban mobility platform”. This blog will be dedicated to a thought experiment (as I used to do in my weekly Dutch newsletter with a commercial move Deliveroo made) in which I summed up several points why this step would be the best or the most foolish choice ever. Not so in order to judge, but in order to make one or two things clear. The one owning the leading app (the ‘urban mobility platform’), has a strong market position. It makes you less sensitive for competition (like Google being the platform almost everyone uses to start their searches) and with all data gathered, you should be able to create many benefits for both your client as your own organization. This model is simply less scalable. It requires more time, human effort, adaptability and money to become successful in your own strength in a new city. Moreover, you are dependent on the legislation which still has to be written. They seem to be crazy…. When adding things up, I think Uber doesn’t have much to choose from. As the platform seemed to be the first app to combine all self-driving cars, it has meanwhile become clear that this is a too long-term scenario as well. On top of that, it has shown that this method won’t provide a solution for the growing mobility problems in our inner cities. They will have to come up with something different. Of course, there is an options for them not to invest in shared bikes, walking bikes and scooters themselves, but it is questionable if the larger parties that have joined the market are willing to offer their supply through a different platform. As this includes that they would provide a third party with their client contact and all their data. They will never do so. Actually, a model which makes participants offer their capacity to others on a central platform only works when the supply is fragmented. Something that isn’t the case in these market segments. Will Uber be able to realize their ambitions? I don’t know. With Softbank as investor (which is taking part in almost all forms of ‘on demand urban transportation’) they might stand a chance, albeit with a heavy and interesting task to accomplish. An Uber-app of the people? Success criteria of platform cooperatives highli... Airbnb as a cooperative: a viable scenario?